In order to provide more and better opportunities for intellectual, professional, and social development, the GSA has initiated a Grants Program that supplies funds for reimbursing graduate students for their expenses. There are two types of grants available from the GSA: (1) Professional Development Grants and (2) Research Grants. For more information on any of these, refer to their pages organized under the ‘Grants’ tab. In order to receive funding through the GSA for reimbursement of expenses, you must complete and submit the application for the grant you would like by the deadlines listed below. On 2/4/19, the GSA Senate voted to suspend the restraints around grant eligibility, as stipulated in the GSA Bylaws section 7.2.3, meaning all graduate programs are currently eligible to apply for GSA grants. If you have any additional feedback on this policy, please email gsa@umbc.edu. Grants are awarded based on the results of a review process described in the GSA Points of Policy (see Section 8). For concerns or questions about this process, please fill out the form on the ‘Contact Us’ page on the GSA Website. Please keep in mind that the application is due by the 15th of each month and will be reviewed by the Grants Review Panel who need about 1-2 weeks after the deadline to meet. Once the panel has approved the grants, they are sent to the OGSL Travel Grant Coordinator who will create eTravel forms as well as notify the recipients within 3 business days. All eTravel forms MUST BE DONE BEFORE THE TRAVEL DATE. 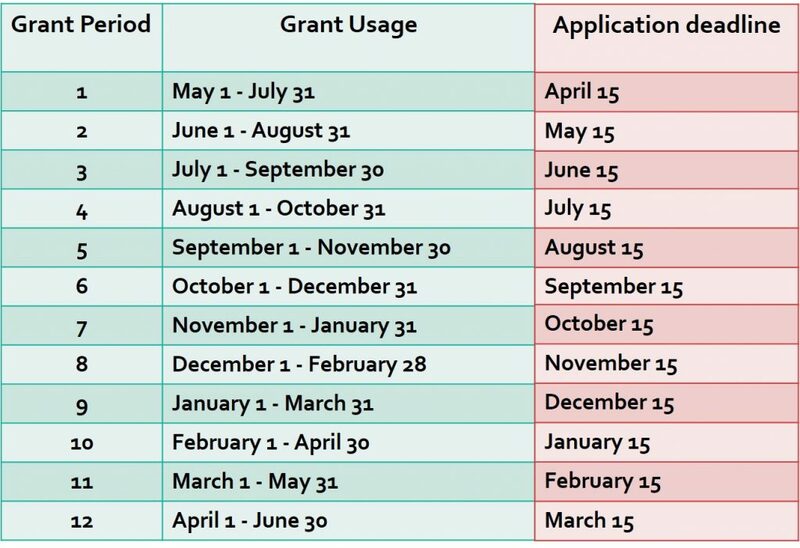 Keeping this in mind, please consider the grant application deadlines listed below very carefully and apply ahead of time, especially if you are traveling in the last two weeks of the month. Please note that each Grant Period spans 3 months with an overlap of one month between each period. Please read the dates carefully and apply as early as you can!